McGeeâ€™s core team explored several engines before settling on Unreal Engine 3 and ultimately found that they were able to integrate content and achieve the visual results they wanted faster and easier with Unreal Engine 3.
â€œThis was primarily attributable to the superior reference materials, tutorials, and content pipeline and tools. Once our decision was made, attracting other team members with UE3 experience and gaining critical knowledge on our own was easy,â€ explained McGee. If you’re interested in how we pulled off on-time development and distribution of 12 hours of episodic content, while building a studio from the ground up, AND being in a foreign land – then you’ll want to check out the full article. I will say a lot of our success is owed to the robustness of the UE3 toolset. Attached to this article you’ll see a time-line which roughly illustrates the cycles our production went through in order to accomplish our development goals. 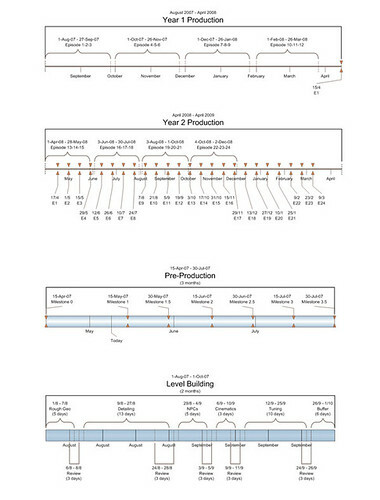 This time line only gives a broad picture and a little detail related to Level Design production. There were in fact many similar time lines running concurrently through all departments, including Concept Art, Asset Production, Animation, and Programming. Soon we’ll release a Post Mortem on the Grimm project which goes into more detail about the development of Grimm. Keep an eye out for it!